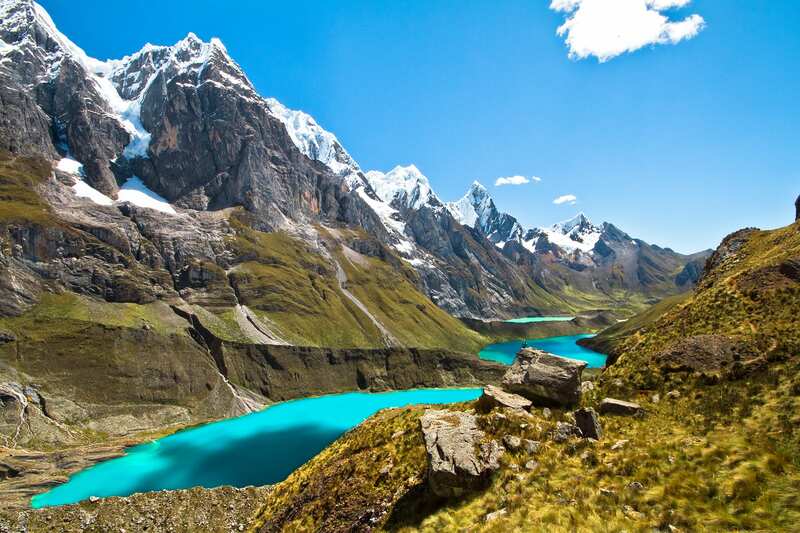 The Cordillera Huayhuash is known as being the best alpine trek on the Planet. The vast landscapes, jagged peaks, turquoise lakes and cascading river are what make this this region so special. The impressive glaciated peaks rise to over 6,600m leaving you in constant awe. Our transport will pick you up at your hotel at 7:00 AM. From Huaraz we start driving South (direction Lima) for about 1 hour before turning east at Conococha towards a small mountain town called Chiquian, where we will have a short break to stretch our legs. After doing so we continue our drive towards the start of the trek in Pocpa (3.400 m) which we will reach after a total of 3,5 to 4 hours drive through spectacular mountain scenery. Here our donkeys and donkey drivers will be waiting for us. While they pack our equipment on to the donkeys we get our day pack ready, put on sun blocker and adjust our walking poles before starting our 4-hours-hike until Cuartelhuain (4.170 m), our first campsite. By then our donkey drivers and cook will have overtaken us – the tents will already be set up and our cook will be waiting for us with a hot cup of tea and a snack. After a relaxing breakfast we climb the first high altitude pass, Cacanan Punta (4.700 m), which is the natural divide between the Atlantic and Pacific Ocean. After all participants have reached the pass at their own pace, we take a break for 10-15 minutes to enjoy the views and possibly watch the Andean Condors. 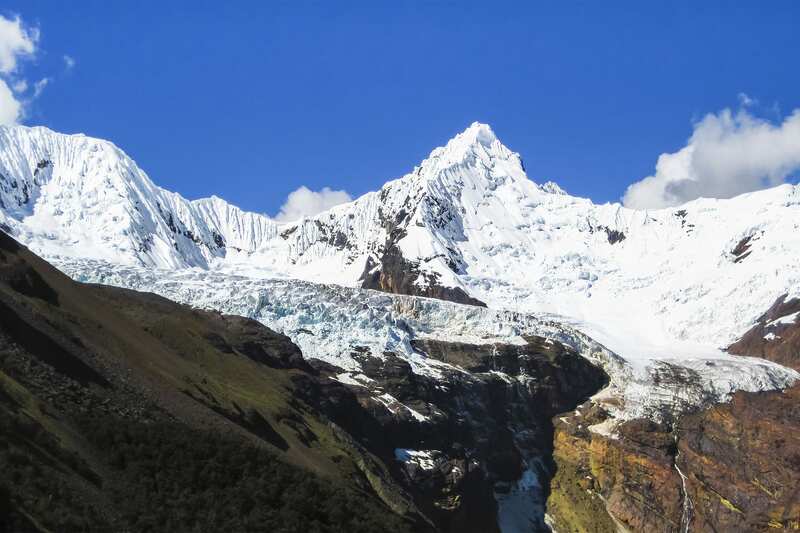 After our break we start hiking downhill towards Mitucocha Lake (4.270 m) from where we can appreciate the view of snow capped mountains Rondoy (5.883 m) and Jirishanca (6.094 m). Few minutes later we reach our next campsite. Our today’s programme starts with a very moderate steadily ascending trail towards the sandy Punta Carhuac (4.650 m). 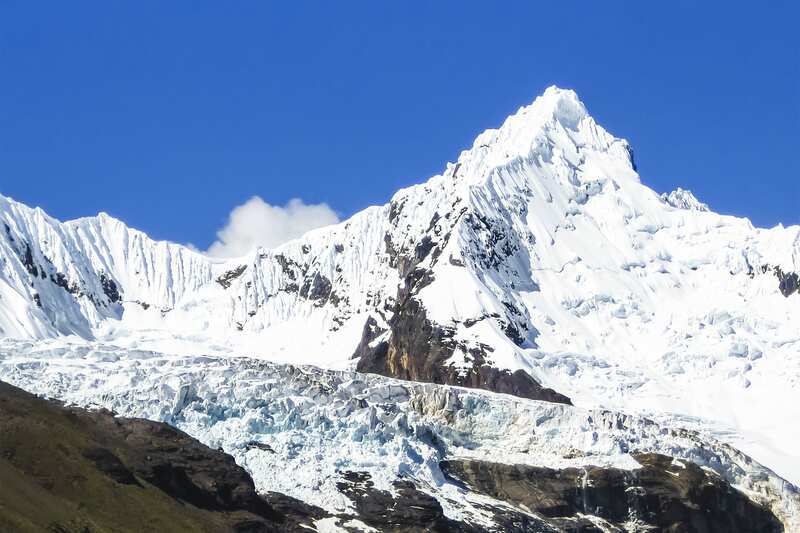 Today we will get larger overviews from the Cordillera Huayhuash including Jirishanca Chico (5.467 m), Jirishanca (6.094 m) and Yerupaja (6.617 m), the latter being the highest mountain of the Huayhuash mountain range. From here we continue hiking to the southwards until we reach our campsite at Carhuacocha Lake (4.150 m) in the afternoon. The rest of the afternoon we use to rest. Apart from being a more difficult/strenuous day, many trekkers consider this stretch of the circuit the prettiest of the whole loop. 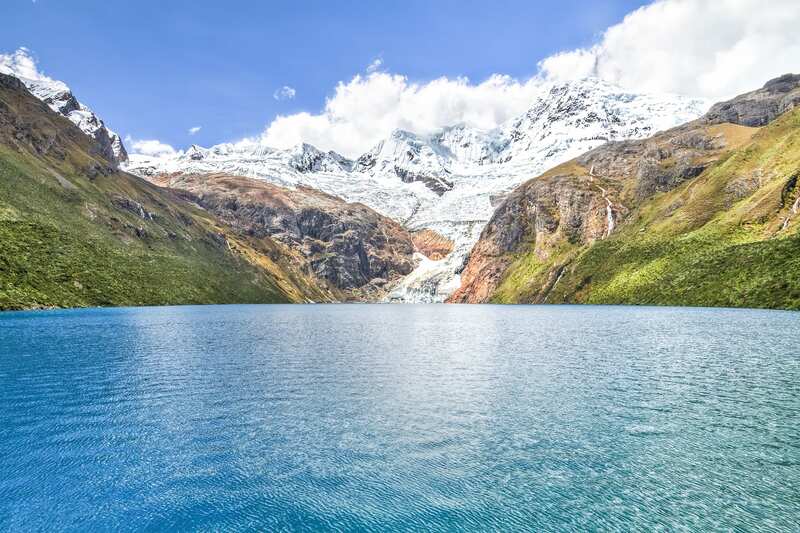 We start hiking along the south side of the Carhuacocha Lake before turning south into the Siula Valley where the gradual ascent towards three glacier lakes, Gangrajanca, Siula Cocha and Quesillococha, starts. At Siula Cocha we take a longer break and those participants with some spare energy can climb an additional 30 meter/5 min. towards a ridge from where Grangrajanca Lake can be seen. Especially pretty are the large pieces of glacier ice floating peacefully in the water. 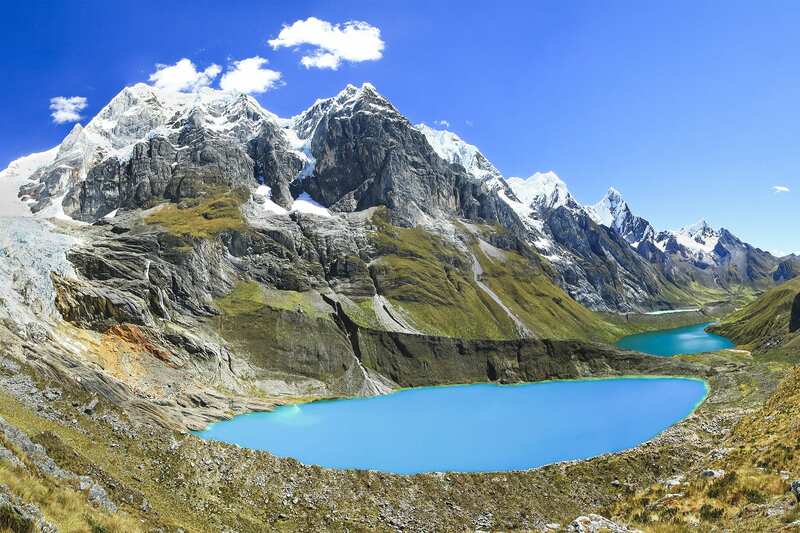 After our break we start the more difficult ascent towards Siula Pass at 4.950 meter - from here maybe the best panoramic view of the Cordillera Huayhuash can be appreciated. After approximately 2 hours downhill hiking towards Lake Quesillococha and Huayhuash Village (4.365 m) we reach our campsite where after a hearty dinner we spent the night. After our exhausting day yesterday, today our day is rather short and the trail is a gradual ascent and gradual descent. In 5 hours we cross the Portachuelo Pass (4.795 m) and walk down to the campsite just after Lake Viconga (4.400 m). In the afternoon there is plenty of time to enjoy the nearby hot springs. Today we cross Punta Cuyoc, with 5.000 meter the highest altitude on the whole trek. On an ascending zigzag trail we hike slowly towards this high mountain pass. Just before the actual pass we reach a flat meadow with 3 small lakes that provides for a nice wind shielded break. From Punta Cuyoc we can see Mount Pumarinri (5.465 m), Cuyoc (5.550 m) and the Puscanturpa range (5.430 m). At this point our trail starts descending towards our campsite in the Huanacpatay Valley (4.325 m). Looking towards the North, we can see the San Antonio pass and lookout point which we will visit tomorrow morning. After our breakfast we leave our campsite hiking downhill toward the nearby San Antonio pass. 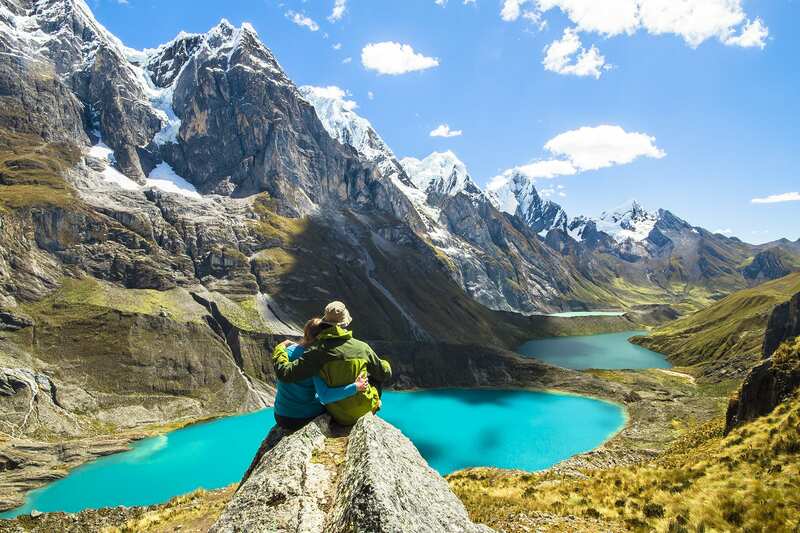 At the saddle you will have some incredible views over the Huayhuash range from the South-West including the Lakes Jurau, Sarapacocha, Caramarca and Mount Trapecio, Jurau, Carnicero and Siula Grande. 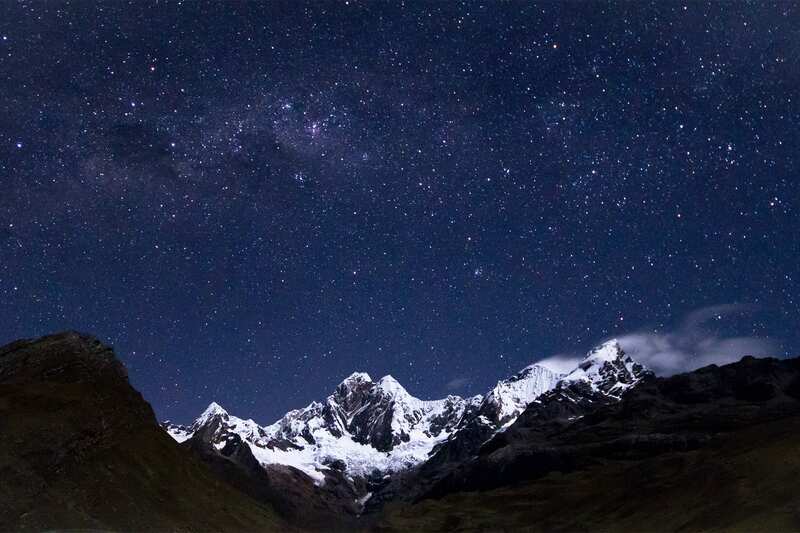 Siula Grande and therefore the Cordillera Huayhuash has come to the attention of the international press after Joe Simpson’s legendary adventure on Siula Grande was made into the film “Touching the Void”. From the saddle we return to the Huanacpatay valley floor to hike toward the village of Huayllapa (3.400 m). After having spent a week at high altitude with purely mountain scenery we enjoy the less high altitude with its presence of abundant flowers, trees and fields. In the vicinity of the village farmers grow their crops on the terraces or “Andenes” that gave the whole South American mountain range its name – the Andes. After spending some time in the idyllic village – having drunk the obligatory beer or soda – we start walking steep uphill until reaching the next campsite Huatia at 4.290 m, approximately 900 meters above the village. From here we can see the south face of Diablo Mudo that some participants may want to summit. Today we start hiking towards Punta Tapush (4.750 m), from where we get a closer view of Mount Sacra (5.548 m) and Diablo Mudo (5.228 m). After passing Lake Susucocha we reach our campsite Cashapampa, with 4.500 meter the highest camp of the whole circuit. Today we have the possibility to split up in two groups. The “hiker group” that walks directly towards Jahuacocha, our next campsite on the lake. 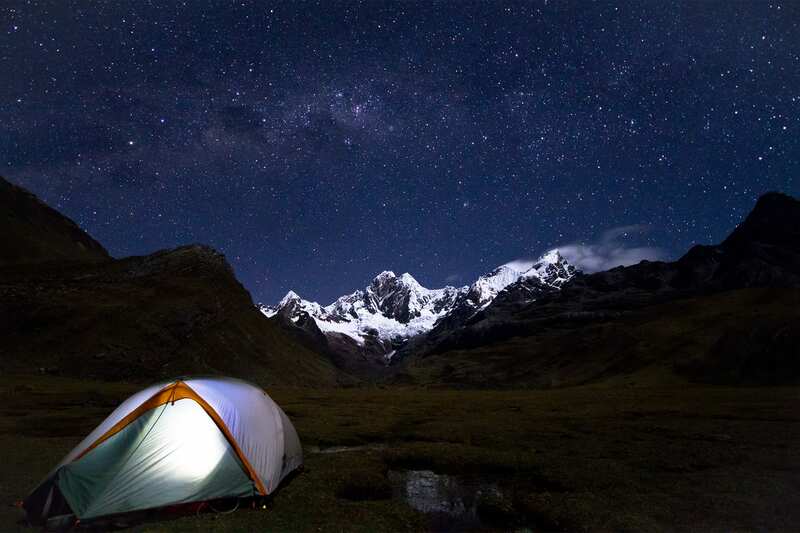 The “climber group” will receive a “wake-up-call” at 2 a.m., have breakfast and then leave the campsite at 3 a.m. to climb Diablo Mudo (5.350 m). After approx. 6 hours you will reach the summit. 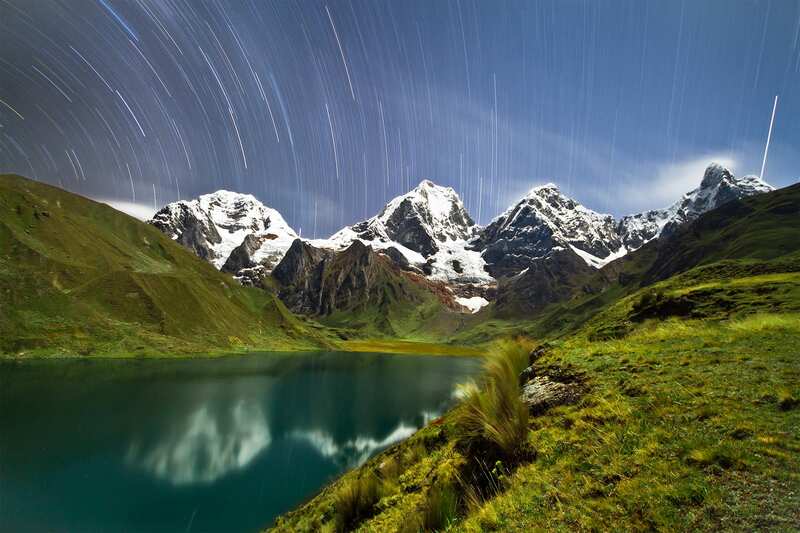 Then you hike down into the Huacrish Valley towards Lake Jahuacocha – the hikers group is awaiting you already! Notification for the summit has to be given before the start of the hike. Diablo Mudo Climb: Needs to be arranged upon booking and there are added costs associated with this option. Please inquire. On our very last day of our Huayhuash loop we cross our last pass, Punta Llamac (4.300 m). After we have crossed so many high mountain passes in the last 10 days, the ultimate seems very low to us. After descending to the village of Llamac where our transport is waiting for us, we say goodbye to our donkey drivers and start our drive back to Huaraz. Private tourist transport from/to your hostel/hotel. Additional beverages or meals in villages. Breakfast on the 1st and dinner on the last day.